The PSA Group-owned brand has confirmed its flagship model, the C5 Aircross SUV, as its first product for India and it’s to be launched by the end of 2020. During a recent press conference in Chennai, Groupe PSA officially introduced the Citroen brand to India. 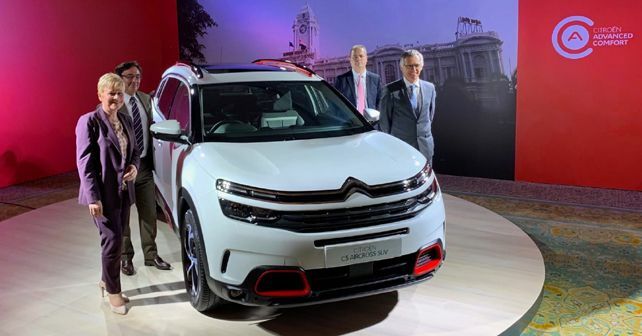 Following the announcement, Citroen India also confirmed that it will begin its India chapter with the launch of its flagship SUV – the C5 Aircross – by the end of 2020. Mr Carlos Tavares, Chairman of the Managing Board, Groupe PSA, Ms Linda Jackson, CEO, Citroen, Mr Emmanuel Delay, Executive VP of Head of India-Pacific, Groupe PSA and Mr Rouland Bouchara, Senior VP of Sales & Marketing, Citroen India, were present at the press conference. Citroen's entry into India represents an important expansion milestone for Groupe PSA, keeping in mind that the group was on the verge of bankruptcy until just a few years ago. Now, though, Groupe PSA is amongst the most profitable carmakers in Europe. With Citroen's debut in India and Peugeot's launch in Russia, Groupe PSA aims to double its sales outside Europe by 2021. Before we get to the C5 Aircross, here's the lowdown on Citroen's roadmap for India. Post the launch of the C5 Aircross, Citroen will aim for one new launch every year– a product designed especially for India. These new models will also be launched here before the rest of the world, under the rubric of Citroen India's 'C Cubed' programme. Further, Citroen India will opt for the local assembly route right from the start, with its manufacturing facility coming up in Hosur, Tamil Nadu (in partnership with AVTEC). The Hosur factory is expected to produce 1,00,000 units per year, and the localisation percentages will be pegged at 95% for components and at 90% for the powertrains. This will help Citroen India achieve its target of a 2% market share within 4 – 5 years of its launch. In terms of customer experience, Citroen India will provide a highly-digital experience, which will enable customers to opt for a host of services online. While Citroen India has given us a glimpse of the C5 Aircross, not much is known about the India-spec model as of now. However, in international markets, it’s offered with either a 1.2-litre petrol motor that pumps out 130bhp or a 2.0-litre diesel motor that churns out 180bhp. Measuring 4,500mm in length, the C5 Aircross also gets Citroen Advanced Comfort, which makes it the 'most comfortable model' in Citroen's line-up. With a high degree of localisation, expect the C5 Aircross to be priced very competitively. Meanwhile, you can read more about the brand's origins here.